The last season of Game of Thrones will start airing on April 14 and HBO's programming Chief, Casey Bloys is all praise for the show's last season. Game of Thrones season 8 will be the last season of the show. HBO's programming Chief Casey Bloys is all praise for the show's last season. The final season will have 6 episodes only. Since the hype, expectations and buzz surrounding Game of Thrones is so high we think some information about the plot, or even an episode or two may leak before the air date. Remember the time when an episode of the show was leaked in India? If you don't, then here is the short version to refresh your memory. In 2017, the fourth episode of season 7 was leaked by an IT professional at Prime Focus Technologies as he wanted to please his girlfriend. Yes, you read that right. Prime Focus Technologies is the agency contracted by Star to manage the data at Star. In the middle of January, HBO released the first trailer for the final season of Game of Thrones. 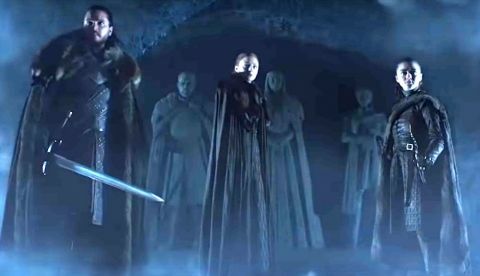 The trailer which is 1 minute 44 second long sees the Starks - Sansa, Jon Snow and Arya, walk the Crypts of Winterfell. As they walk you can hear voices from the statues of Catelyn Stark, Eddard Stark, and Lyanna Stark (Jon Snow’s real mother and Rhaegar Targaryen’s wife). Each of the statues repeat dialogues from past seasons. You can check out our detailed analysis of the trailer here. Up until now, there have been 7 seasons of Game of Thrones with an overall of 67 episodes. If you are one that wants to catch up by watching all the episodes or are one that finally wants to get onto the Game of Thrones bandwagon, you could do so by watching 1 episode a day starting February 9 to gear up for the final season. If you havent started, you can always catch up by watching multiple episodes over the weekend. The new season of GoT will be 6 episodes long, with each episode expected to be feature length. Game of Thrones Season 8 episode 1 airs on 14 April 2019.